Forty years later, it still gives you chills. 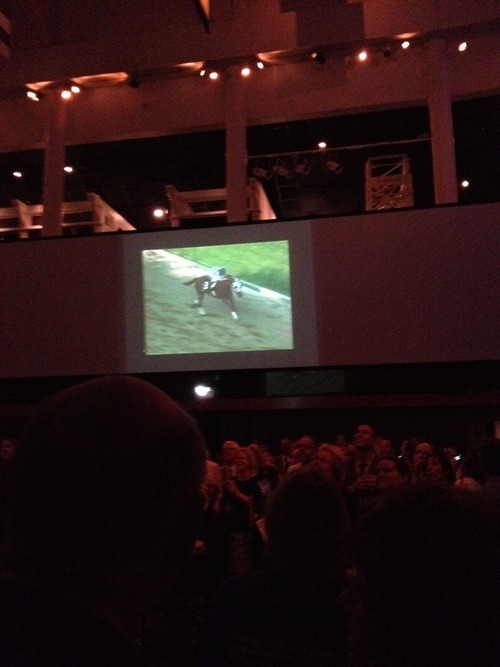 Watching video of Secretariat blazing down the home stretch in the 1973 Belmont Stakes, winning the third leg of the Triple Crown by 31 lengths, a crowd gathered at the Kentucky Derby Museum earlier this week cheered as if they were seeing it live. Master distiller Jim Rutledge then led the group in tasting the barrel-strength batch of Four Roses that Mrs. Chenery hand-selected in a visit to Kentucky in March, pointing out its chocolate-cherry flavor notes. Bottle No. 1 was given to the Derby Museum. Many of the 3,503 other bottles – all signed by jockey Ron Turcotte and adorned with a tag sporting Penny Chenery’s signature – were purchased at the event; the rest will be sold at outlets along the Triple Crown trail. That’s also how racing fans felt about Secretariat, who set race records in every leg of the Triple Crown that still stand today. There hasn’t been a Triple Crown winner since 1978. Will this be the year we see another? The hunt starts tomorrow.